Even if the company's dead and gone, the paper may be collectible. Fewer companies issue paper stock certificates than a century ago, but older certificates are still out there. Sometimes, they disappear for a while, hiding in a safe-deposit box or a brokerage account the owner forgot about. Eventually, like unclaimed bank accounts and insurance policies, they pass to the state government's control. That doesn't make them worthless though. If an account or asset sits in a bank or brokerage for more than a year with no contact from or action by the owner, it becomes unclaimed. This can happen to stock certificates, mineral royalty payments, utility security deposits and uncashed payroll checks, among other assets. If they belong to you, either by purchase or inheritance, you can claim them if you find them. The National Association of Unclaimed Property Administrators' website has links you can use to begin a search of state unclaimed-property databases. If it turns out you inherited a few hundred old certificates from IBM or Microsoft, you can sell them. The simplest way to do that is through a brokerage account. Open an account if you don't have one already and ask the broker about the firm's procedure. Sign the shares -- there's a place for that on the back -- and take or mail them in using certified mail for security. Once the brokerage posts them to your account, you can sell them like any other shares. If you don't recognize the company name, you have more work to do. To find out if the business is still around you can search online stock services, corporate histories, and state records on incorporating and dissolving companies. If the company liquidated, the stock is now worthless as shares. There are collectors, however -- scripophilists -- who love to buy old stock certificates. 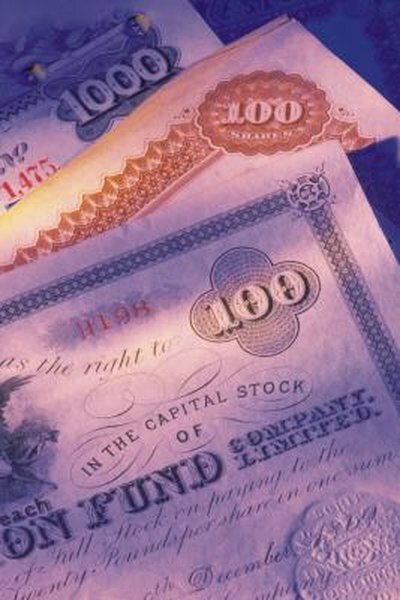 You can talk to antique dealers or online scripophily groups and see whether your shares are collectible. You may discover that your unclaimed shares belong to a company that merged or got taken over by another firm. If that firm is still in business, your stock may be worth something after all. If there's a transfer agent -- a business that keeps records of stockholders -- named on the certificates, the agent may be able to help you figure out if your dead company is part of something bigger now. The price may have no relation to the firm's current stock value, so you won't know what it's worth until you ask. National Association of Unclaimed Property Administrators: What Is Unclaimed Property? Enoch Pratt Free Library: What do Do With an Old Stock Certificate?